If you’re new to micro-needling let me give you a quick run down. In short, it involves using a bunch of tiny needles to make teensy little ‘wounds’ in the top layer of your skin. This inspires your skin to heal and when it does it produces a surge of collagen. More collagen is good because it means firmer, more youthful looking skin. It can also help refine pores and improve the look of wrinkles, scars and stretch marks. You can puncture it with a dermaroller but an electric pen is much more effective. While Dermapen is the best known brand it’s pretty expensive which is why it’s good that competitors are cropping up and one of them is the DermaSix collagen pen created by local spa brand Six Sensational Skincare. 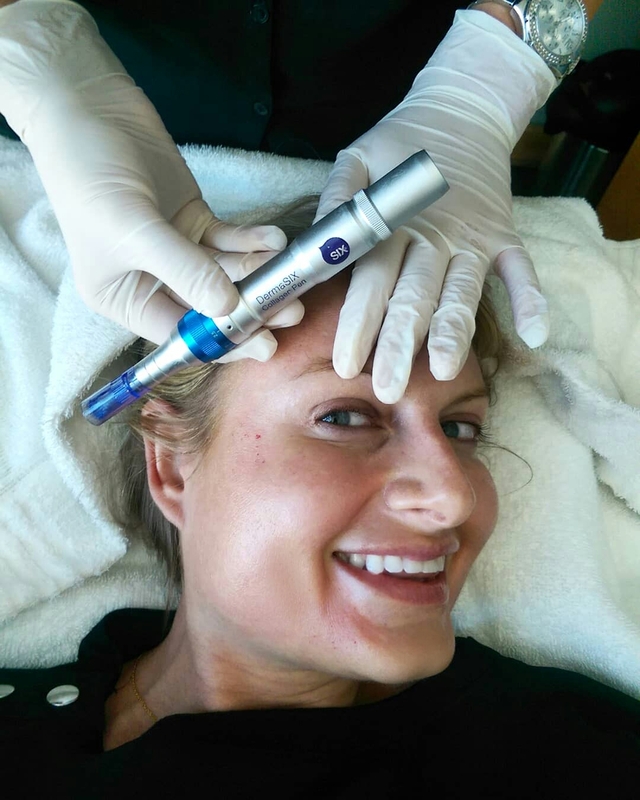 Six’s founder, Marisa Dimitriadis, says the DermaSix pen is superior to Dermapen because, while the latter has just one speed setting, her pen has three and can go much faster. It’s the speed, she says, that allows you to work faster so you can go deeper in a way that’s not as painful. It’s also got four different heads – a single pen that’s great to target a particular line, 16 pins to be used all over, a whackload of pins to use on your body (I’ve forgotten the actual number) and a microdermabrasion head to exfoliate. Like most salon-grade micro-needling pens, it’s needle length can be altered from 0,5 to 2,5. (2,5 would be used on your body, not your face, and only a doctor would go there.) The biggest plus? Treatment costs will vary depending on where you go but ranges between R650 and R950 with a therapist and R1500 with a doctor. If you’ve ever gone for Dermapen, you’ll know this is half the price! 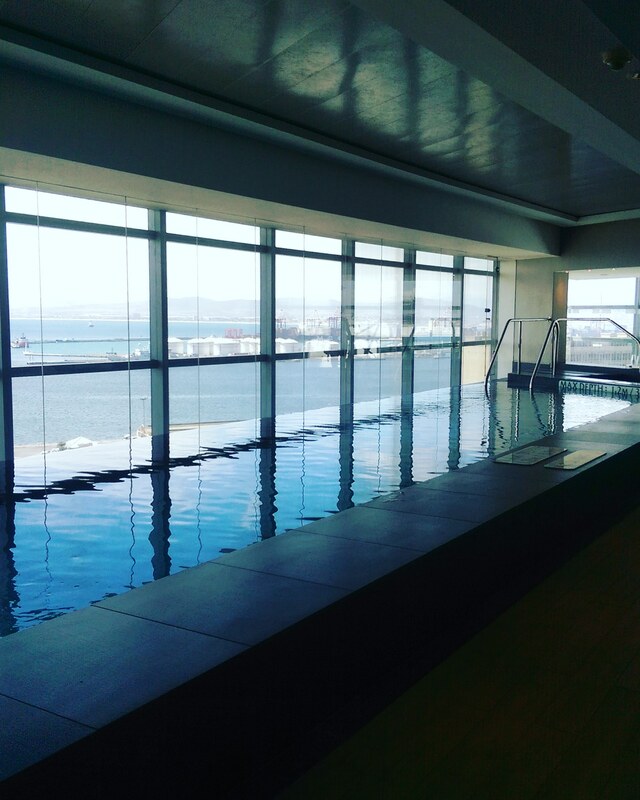 How mooi are the views from The Heavenly Spa’s pool? I experienced a DermaSix pen session, something Six is referring to as a ‘mini vampire facial’ (more on the blood bit later) at the Heavenly Spa at The Westin in Cape Town and was impressed with it. It’s basically the same deal as Dermapen yet less expensive and performed in a way that’s more luxurious. To begin, my therapist gave my skin a quick cleanse before applying an anaesthetic cream. She then whipped out the pen and ran it all over my forehead. The forehead is the most uncomfortable part of the treatment as your skin is closest to the bone but this time it hurt like hell. There’s no reason why this should’ve been more painful than the four Dermapen sessions I had back in the day so I don’t think my anaesthetic, which had only been on for four minutes, had fully kicked in yet. As time ticked on, however, my face got progressively number and soon I didn’t feel a thing. 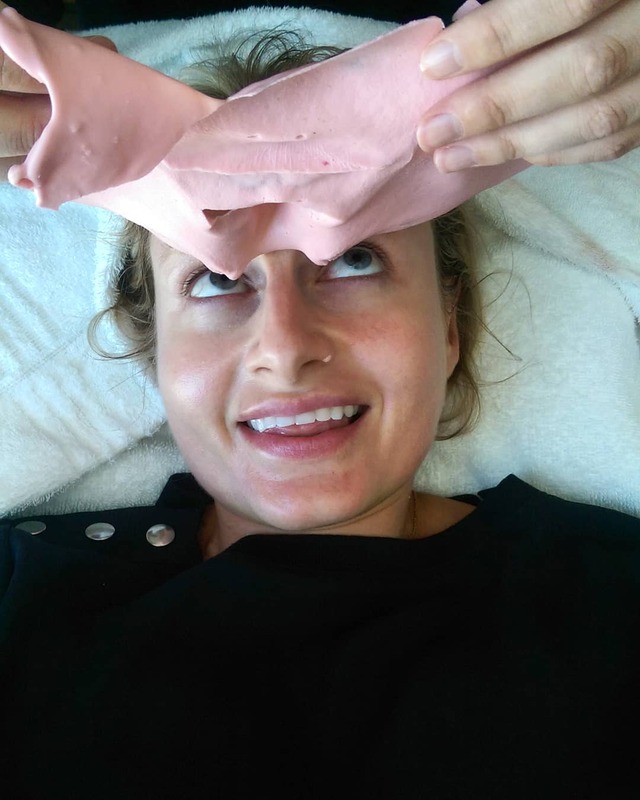 By the time my nose got done it just felt like an electric toothbrush was being run over my face and it felt exactly the same as the Dermapen sessions I’d had in the past which were all painless. In fact, it wasn’t even ‘uncomfortable’, it was merely a sensation. A lot of you asked what foundation I’m wearing in this shot. It’s just Clarins Liquid Bronze self-tan (applied the night before), Catrice Camouflage Cream under my eyes and Palladio Wet Dry foundation used as powder. After the pen is run around your face, you’ll bleed a bit and that’s when the therapist will use one of Six’s booster elixir serums. They have six for you to choose from. Each has a different ‘target’ that ranges from firming to lightening and their focus is on botanical extracts. The Fine Lines & Wrinkle one, for example, makes alfalfa and centella (gotu kola) extract that can help encourage your skin to produce more collagen. The booster serum is mixed with your blood and gently massaged back into your skin*. Next, your face is carefully massaged with two ice cold stones which feels incredibly soothing. To finish, a peel-off mask is applied to your entire face (eyes, mouth, the works!) and again with the intension to calm and soothe. I was quite worried about this. The idea of ‘peeling’ something away from skin that had just been needled sounded painful but it didn’t hurt a bit and can away in a sold chunk. (I was actually so numb at this point you couldn’t cut off my nose with a garden scissors and I wouldn’t have noticed.) Next time, I’ll skip the mask, but only because I don’t think it’s necessary. The heavy lifter here, in regards to results, is the pen, not the accoutrements. See how incredibly natural my lips are looking, by the way? If you follow me on IG you’ll know I had them plumped up a bit the other day. Dr Mignon Laub is a lip goddess. After all that, my therapist applied Six’s 02 Serum, a hydrating glycerin-based product that helps restore your skin’s barrier function. (I declined the final step – sunscreen – as I was going straight home and didn’t want another layer if I didn’t need it.) My instructions were that I could get back to business the next day provided I avoided high doses of potentially-irritating retinol for a while but for now I was to go home and not touch my face at all. Being me, I went home, waited a few hours and then gently cleansed my face using Cetaphil. I then applied a 15% vitamin C serum as I didn’t want to waste an ‘open skin’ opportunity. Vitamin C is probably the most commonly used active after micro-needling sessions as it’s one of the most proven collagen-encouragers but not as irritating as the gold standard which is retinol. To be clear, whatever you apply to your skin after a micro-needling session will penetrate more than it would otherwise, but it won’t remain in your skin forever. To truly see results from active ingredients you need to use them on the reg. Small amounts of high potency actives every day will always beat out using rubbish skin care at home and then heading to the salon for a deep dose once a month. It’s for this reason I don’t review facials that merely involve the layering of leave-on products. I feel that you’d be better off buying those products (assuming they’re good ones) to use every day as opposed to splurging on having a therapist do it for you every couple of weeks. Now let’s talk results. After a micro-needling session your skin will feel tight and sunburned and look a little red. This lasts a day or so and the redness is so mild you can easily cover it up with make-up. Later, like in the next three days or so, your skin might feel a little rough or dry, as though it’s got a micro-fine scab on the surface. Don’t freak out or attempt to exfoliate it off. This is super short-lived. When that disappears you’ll be totally back to normal. I might use this as my LinkedIn profile pic. You dare me? The real results come much later as it takes about a month for your face to create the collagen ‘ignited’ by the needling and it can continue to grow for months afterwards. Still, I can’t take a before and after picture that would yield visible results but because I don’t have a very visible issue, something like acne scarring, to target. This doesn’t mean it doesn’t work. It does! If your end goal is to give your face a boost of collagen, micro-needling is a proven way to get it and DermaSix is basically Dermapen at a snip of the price. You’d do well to call around to find a salon offering the treatment for R650 then go for three DermaSix session spaced out a month apart and commit to doing it once a year. If you’ve got a more targeted issue, however, something like a scar or stretch mark, you’ll need more sessions closer together before you saw an improvement and, in that case, I’d rather go to one of their doctors. The ‘contact’ page on their website has all their details so you can get in touch and be put in the right direction. *For the record, Six is calling this a mini vampire facial but it’s quite different from a regte vampire facial. The latter involves drawing blood from your arm, separating the platelets from the plasma and massaging the latter into your face. Six’s facial doesn’t require opening a vein nor does it isolate plasma. This isn’t something I’m concerned with, however, as I’m not convinced either practices are worth the hype. The mere act of needling your face, however, most definitely does stimulate collagen growth and that’s enough for me. I love needling, busy with a Skin Renewal Course now. I did a course a while ago and it definitely improved my acne scarring. How deep did they go, and also which serum did you use? You know I need all the deets! I would like to know what is the price of the derma Six pen? Hi Magda! Apologies for the slow reply. Your comment ended up in my spam folder for some reason. I actually have no idea how much the pen would cost. I reckon get in touch with the company to ask.